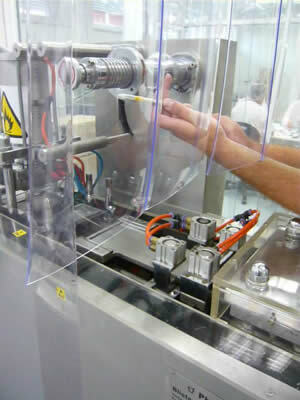 Validation & Measurement clean rooms, cleanliness | LABOX spol. s.r.o. 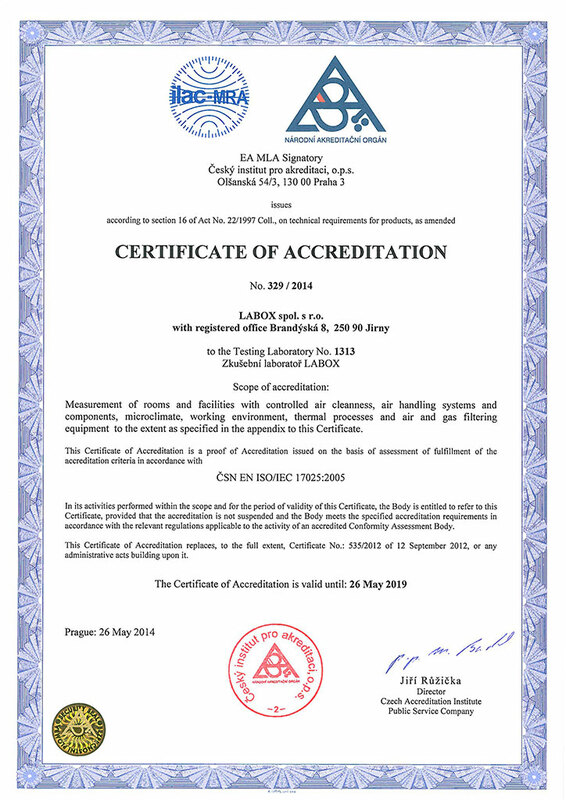 Accredited testing laboratory No. 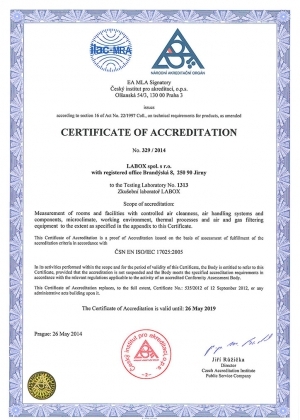 1313 is accredited by CAI (Czech Accreditation Institute), according EN ISO/IEC 17025.
microclimate temperature, humidity, flow rate, barometric pressure, cleanliness level, etc..
air parameters measurement flow velocity, volume, pressure difference, pressure, temperature, duct air tightness, smoke air flow visualization test, etc. 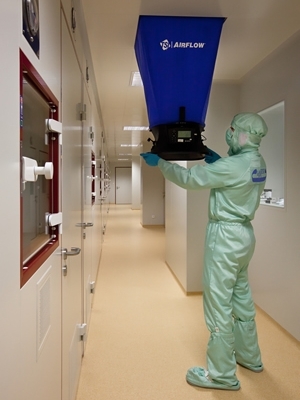 clean rooms and laminar flow cabinets, microbiological safety cabinets, isolators, safety hoods qualification of clean rooms and laminar flow cabinets in accordance with EN ISO 14644:2015, CM/ResAP (2011), IES, FS209E, VYR-32, VYR-36 (SUKL), FDA Guidelines, cGMP (FDA), GMP Volume 4, (filter leakage test inc. installation leak, airborne particle count, cleanliness level, airflow velocity, airflow uniformity, recovery test, pressure difference test, flow visualization test, containment leak test, temperature and humidity test, etc. 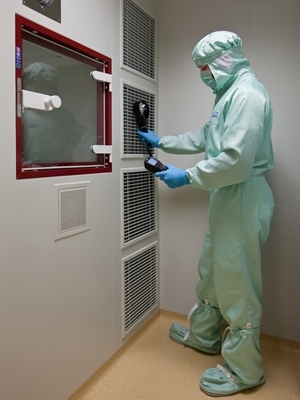 ), including microbiological inspection of air cleanliness, regeneration time of rooms, cleanliness, tightness of air conduits and devices, measuring of filter devices efficiency, smoke air flow visualization test, etc. moist heat and hot aire sterilizators, thermostats, incubators, refridgerators, freezers, desk and chamber validation of steam and hot-air sterilisers according to EN, ISO, VYR, further of freezers, thermostats, incubators (including CO2 incubators), refridgerators, chamber cooling plants, etc. Temperature map, stability study, heat penetration in material, verification of probes, steam quality, pressure, CO2 level, etc. filtration stations and filter systems efficiency and fraction efficiency measuring, total efficiency of highly efficient filter devices, fraction efficiency of highly efficient filter devices, etc. air-conditioning systems flow volume, pressure graph, flow velocity, flow graph, tightness of air conduits, etc. For further information and questions concerning validation, measurement and qualification will be answered by email or phone. Or contact us using the form and our staff will contact you as soon as possible.